While the debate over charcoal or gas grilling is never-ending, it’s clear that charcoal is a rising star in the home-cooking world. Reaching higher temperatures and adding an unmistakable smoky deliciousness, charcoal is a firm favorite for those seeking a perfect sear and crust on their steak. This article will lay out what to look for when purchasing a charcoal grill and give you an overview of the top 5 best charcoal grills available in 2018. Our top overall choice for best charcoal grill is the always dependable Weber 741001 Original Kettle Charcoal Grill – it’s a classic, for good reason, and has everything you need in a charcoal grill without costly, unnecessary extras. The Char-Griller 1515 Patio Pro is a heavy but sturdy grill that comes equipped with a convenient side shelf and removable ash pan. 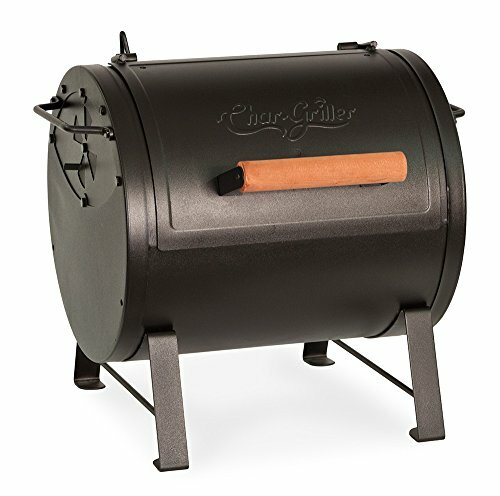 With an extremely unique acorn-shaped design and red exterior, the Char-Griller E06614 Akorn Jr. Kamado Kooker delivers even heat and precise temperature control. The infrared technology of the Char-Broil TRU-Infrared Kettleman ensures evenly cooked food by eliminating hot and cold spots on the cooking surface. If you’re looking for a compact, portable charcoal grill, Char-Griller’s 2-2424 Table Top Grill is for you. Charcoal has the ability to reach temperatures that are considerably higher than can be achieved with a gas grill. These soaring temperatures sear meat quickly and give food an excellent smoky flavor, ideal for barbecue enthusiasts looking for an authentic grilled taste. If portability is something important to you, many charcoal grills are relatively lightweight compared to their gas counterparts. This is partially due to the fact that they generally have fewer parts than gas grills. Charcoal grills can often easily be transported from your yard to the beach or a camping ground. Charcoal itself is widely available from home improvement and grocery stores, so it’s easy to pick up a bag when you’re already on the road – much easier (and safer!) than dealing with propane. 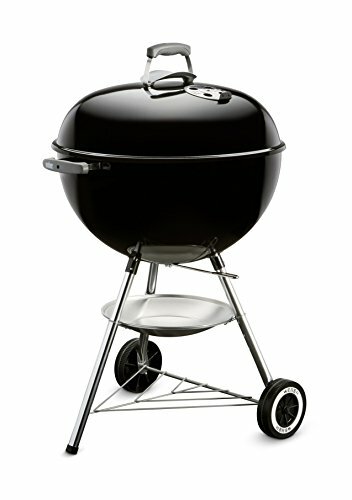 Additionally, lovers of charcoal grills often tout the ritual as part of the appeal. Lighting the briquettes or coals, letting the flames settle to embers for cooking, enjoying a few drinks with friends on a warm summer evening. For charcoal enthusiasts, the longer prep time and social aspect of this style of grilling has them avoiding gas-powered grills in favor of the slow burn. There are charcoal grills in a range of sizes, designed to suit all outside spaces, from cozy balconies to sweeping yards, and it’s crucial to think about where you are going to put your grill – and if you’ll want to take in on the road. As charcoal can produce more smoke than a gas grill, it’s also worth considering how the location of your grill may impact neighbors living nearby. While charcoal grills are lower-maintenance than their gas-powered counterparts, clean-up is generally messier. Ash residue should be cleared out after the coals have cooled, and the easiest cleaning solution is to choose a grill with an ash-catcher, which reduces mess and keeps your grill in top condition. We made easy cleanup a priority for qualifying as one of our best charcoal grills, so all the options on this page include some sort of mechanism for simple cleanup. Storing a charcoal grill is much like storing a gas grill – the best practice is to keep it covered and protected from the elements. Storing a grill outside is fine, but you’ll probably want a waterproof cover to protect against the elements. Consider also where you’ll be storing your charcoal, as the fuel source doesn’t come attached to a charcoal grill. Briquettes or coals need to be kept in a cool, dry place, safe from rain and high humidity to maintain their effectiveness. Our top choice! Classic in shape and design, the Weber 741001 Original Kettle Grill provides a compact yet spacious grilling area, complete with the Weber damper system, designed to allow for both slow smoking and high-heat searing, depending on your personal needs. Standing at just under 40 inches high and 25 inches wide, this grill suits both small patio areas and large yards, ideal for any outdoor space. Featuring Weber’s One-Touch system, cleaning this grill is hassle-free. Ash is caught conveniently in the fully-enclosed catcher, preventing further messes from ash being blown around. Wiping down the grate after it has cooled is all it takes to keep this grill spotless and working at optimum efficiency. The grilling grate is hinged for easy access for cleaning and also to adjust the coals during cooking, allowing for more accurately controlled heat distribution. It is, however, a static grate in the sense that the distance from the coals cannot be controlled, which may be an important factor for those who are more serious about the intricacies of grilling. Carefully crafted from steel and with a porcelain enamel coating, the grill bowl and lid are designed to be supremely durable, resistant to weather and even the highest coal temperatures. The Weber Kettle Grill is designed to withstand repeated use year after year, never rusting or warping due to heat or environmental effects. Specifically designed with small patios and decks in mind, the Char-Griller 1515 Patio Pro offers a significant 250 square inches of grill space, easily able to handle some serious cook-out meats and veggies. Relatively lightweight and portable, this grill can easily be transported to any location and is fitted with wheels for ease of movement. Clean-up is made easy with a removable ash pan for dumping out waste ash, meaning a quick wipe-down of the grate is all that is needed to keep this Char-Griller in top condition. Constructed from heavy-duty steel and with a powder coated finish, this grill isn’t likely to tarnish anytime soon. While keeping it covered and protected from the elements is always your best bet, the sturdy nature of this grill means that it excels in terms of durability. This grill requires some instructional know-how to put together, and the guide provided can prove to be a little difficult to make sense of. With patience and a few basic tools, the task can be accomplished fairly quickly. Though the grill is spacious enough to accommodate a whole chicken or a row of shish kebabs, those who are interested in using this particular grill for smoking meats may run into issues regarding temperature control. It is advisable to purchase a grill thermometer for more precise temperature measurements, as this grill does not have one included. Designed both for easy grilling and lengthy smoking, the Char-Griller Akorn Jr. makes light work of any and all foods. With a uniquely shaped design, this compact grill offers the cook a temperature range of between 200 and 700 degrees Fahrenheit for ultimate control. This design is also fuel-efficient, allowing for less charcoal to be used with each use. Featuring adjustable dampers on both the top and bottom of the grill to ensure even air flow, the Kamado grill allows for exceptional temperature control. Weighing in at just over 40 pounds, this grill has the potential to be portable, although it is lacking wheels for easy transportation. Considering the relatively light weight for a grill with this versatility, the Kamado is a good option for those considering camping vacations or tailgating. It is worth noting that this grill requires assembly at home, and as with anything that needs home assembly, there may be some hiccups when putting it together. However, the only tool required is a screwdriver, which means that this grill can be assembled by anyone with even the most basic skills – with some patience. At 25 inches tall, the Kamado grill is considerably lower to the ground than other grills on this list and may require raising to ensure comfort when actively cooking food. 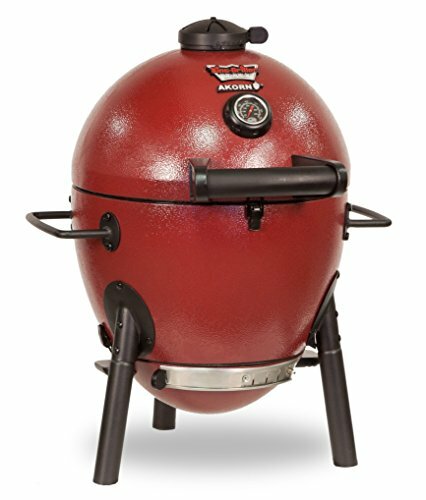 Note that this grill also appears in our best kamado grill roundup article – check it out if you’re interested in learning more about kamado grills! Allowing for precision and even heating during cooking, the Char-Broil TRU-Infrared Kettleman Grill uses infrared technology to prevent hot and cold spots on the grill, ensuring fuel economy and speedier cooking. With 360 square inches of grate space available, this Char-Broil grill allows for a considerable amount of food preparation at one time. The no-fall-through grate also helps to prevent flare-ups due to food and fat dropping, resulting in a healthier meal and more even heat distribution, as well as easier clean up after use. If you need to move or transport this grill, it features sturdy wheels for easy movement. The Char-Broil grill also has a built-in temperature gauge in the lid, allowing for the cook to keep a close eye on pre-heating and choosing the perfect grilling temperature for your food choices. It is worth investing in a cover for this grill, to protect the ash catcher from water build-up during rain and damp conditions. 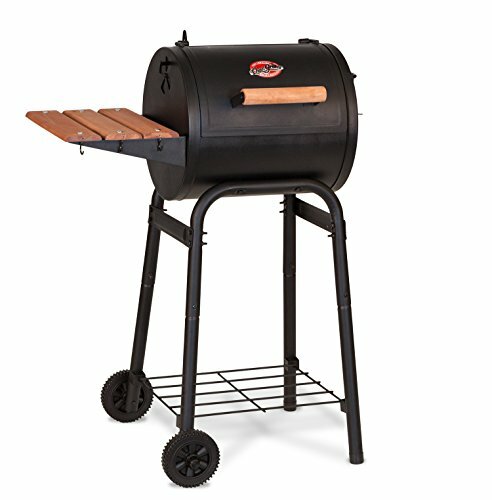 While there is a rack beneath the grill that is ideal for storing charcoal between uses, this grill does not feature a table or rack for placing food and tools on while cooking. Portable, versatile, and weighing 40 pounds, the Char-Griller Table Top Grill can be used both for quick barbecue grilling or for lower temperature, long-haul smoking. For a small grill, it boasts a 250 square inch cooking area, ideal for use in small areas like patios or balconies, or for taking on vacation to campsites or out for the day picnicking. Crafted from durable, heavy steel, this tabletop grill is designed to last for many years and many uses. The grill makes clean up easy, with a removable ash catcher and simple design that enables easy access to all areas. The cast iron grate allows for even cooking and won’t warp or tarnish even when subjected to high heat. Designed for use on a tabletop, or converted as a side fire-box for a larger grill, this particular model only stands 16 inches high, which may prove inconvenient. The grill comes fully assembled and ready to use, making it ideal for taking on trips or tailgating. Being small in size gives this Char-Griller grill an advantage to those living in apartments with limited outdoor space, and fuel economy also prevents excessive smoke production. 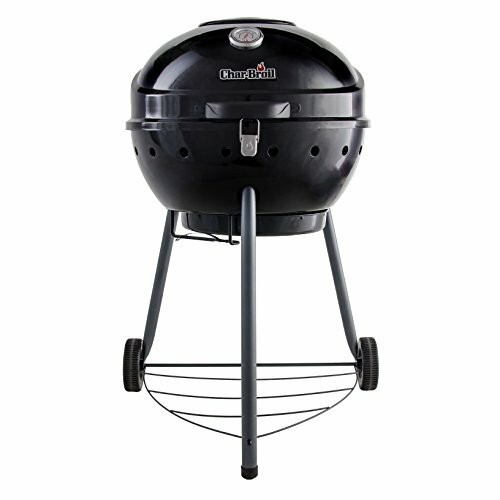 Though all of these grills have impressive merits, the clear favorite is the Weber 741001 Original Kettle Charcoal Grill, which offers exceptional temperature control through air flow and vents, a lightweight design ideal for use in many locations, as well as a compact design for use in small outside spaces, and superior fuel economy. This grill allows for healthier cooked meals, both quick grilling and longer, slower smoking, easy cleanup, and that classic barbecue design that fits effortlessly into any outdoor space. I hope our best charcoal grills roundup helped you choose the best grill for your needs. If you have any questions or comments, please leave them below! Best Electric Smoker to Buy in 2019 – Top 5 Guide! Best Indoor Grill to Buy in 2019 – Top 5 Guide and Reviews!